All of us dog owners can identify with that moment where our dog does something that, frankly, we really wish they wouldn’t. Millions, no, billions are spent and earned around the world as a result of dog owners who simply want their beloved canine to behave more appropriately. Here we’ve got 27 foundational dog training tips that you should memorise to your internal hard-drive (that’ll be your brain!). Each excellent in its own way, but together – these are 27 rules that any dog owner will benefit from when it comes to having better behaved, happier dog and owner. Enjoy! 1. Concentrate on what your dog is doing right. Professional dog trainers everywhere tell their students to reward their dogs when they do something right. This “positive training” method is in contrast to training that centres on punishment. Trainers recommend that owners praise and reward their dogs with treats and affection for good behaviour instead of just scolding them for bad behaviour. 2. Be proactive and keep your dog from behaving badly in the first place. One of the most important tips that a professional dog trainer will tell his or her students is that good behaviour is not just the responsibility of the dog. The owner must make every effort to avoid giving the dog the ability to engage in bad behaviour while they are still learning the ropes. For example, if you notice that your dog likes to chew, it’s important to make sure that everyone in the home puts their shoes behind closed closet doors to remove temptation. 3. Stop saying NO! One of the biggest mistakes that people make when training their dogs is saying NO without giving the dog an explanation of some type. Dogs, much like children, will become confused with a simple command of NO! Here’s what you should do instead. If your dog is stealing the cat’s food, tell him NO and then gently guide him to his own food dish. Or, if your dog is chewing on a table leg tell him NO and give him rawhide or another toy on which he can chew. Once your dog begins to actually use the new behaviour, reward him with treats, toys and praise. 4. Learn the difference between boredom and separation anxiety. It is important to determine whether your dog is misbehaving when you leave home because he is bored, or because he is experiencing a case of separation anxiety. Figuring out why your dog is engaging in bad behaviours is usually the quickest way to combat the problem. If boredom seems to be the issue, you can probably keep your dog from destroying your house during alone time by providing him a toy stuffed with treats or something else that will help exercise his mind a little. If separation anxiety is the problem, you will need to learn ways to desensitise your dog to not only your absence, but also your “preparing to leave” routine. 5. Consider trying clicker training. 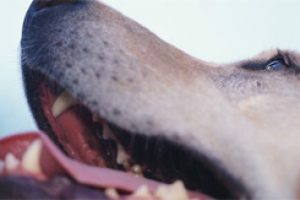 Clicker training is a relatively new technique in the dog training world and involves the owner using a specific sound to indicate to their dog that a particular behaviour is acceptable or desired. 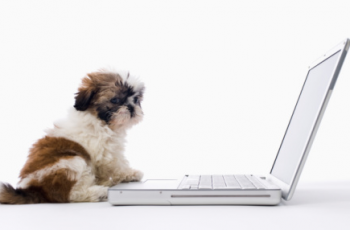 The owner will repeat the “click” and then reward their dog for his or her good behaviour. The positive feedback will encourage the dog to repeat the good behaviour. 6. Be patient, persistent and consistent. These three behaviours on the part of an owner will develop similar behaviours in a dog. Patience means that you understand that learning new behaviours may take some time and a lot of practice and repetition. Persistence means that you, as the owner, do not give up when training does not seem to be going well. Consistent means that your dog knows what to expect from you. For example, if you always say NO when your dog is misbehaving, they learn to recognise NO as a sign of disapproval. Conversely, if you only give treats for good behaviour, your dog will learn to recognise such positive feedback. 7. Start early. As soon as you get a dog, you should begin training in some capacity. If you are getting a late start, it may take some time to catch up. The key to remember is that training is often nothing more than reversing bad habits and behaviours. If your dog is young, they haven’t had a chance to develop a significant number of these bad behaviours and training will be simple. With an older dog, you really have to unteach everything the dog knows about behaviour and start to reteach behaviours that you find acceptable. 8. Be kind and gentle for best results. An owner who constantly punishes his or her dog for bad behaviours is bound to be a lot less successful than an owner who is gentle and kind, rewarding his or her dog for acceptable behaviours. Consider offering your dog plenty of praise, and be gentle when redirecting his attention from a bad behaviour to one that is more acceptable to you. 9. Have reasonable expectations. For example, if your dog misbehaves at home you are wise to expect that he will misbehave at the dog park or in the yard. Therefore, if your dog is having trouble paying attention to your commands you will want to make sure to keep him on a leash when outside. If your dog jumps on people in the house, expect that he will be rough with other dogs. You can reverse these behaviours through positive training, but you need to realise that bad behaviours will most likely continue regardless of the circumstances until they have been unlearned by your dog. 10. Always enforce your commands. If you give commands, but do not enforce them, your dog will learn that there is no reason to listen to you. On the other hand, if you back up your commands with reinforcement he will quickly learn that you mean business. For example, if you tell your dog to sit and he ignores you, gently push him into the desired position and praise him. Always praise good behaviour as a means of enforcing your commands. 11. Use the ONE command rule. Only give your dog each command one time. If you want your dog to sit, tell him SIT! If your dog decides to ignore the command the first time, gently place him into the sit position and then praise him. Do this with every command, so that your dog doesn’t think that your commands are optional. Stick to the ONE command rule, and your dog will quickly learn to take your commands seriously. 12. Clearly define your commands. If you expect your dog to follow commands, then it is imperative that he understands what it is that you want him to do. For example, if you are trying to teach him to sit you will only confuse him if one time you use the command SIT and the next time SIT DOWN. If he’s confused he’ll most likely just ignore you. And this can lead to a vicious cycle. So, pay attention to the commands you are teaching and don’t confuse your dog by being inconsistent. 13. Teach your dog to read your tone. Tone is just as important as the actual command that you are giving. Therefore, try to always use a consistent tone when issuing a command. Yelling a command will be less effective than just using a firm and authoritative tone. Pick a tone, and stick with it. Your dog will begin to recognise that tone, and respond to what you are telling him more effectively. 14. Analyse stubbornness. If you find that your dog is stubborn and does not want to listen to your commands, there may be a simple explanation. Look for signs to see whether you are giving commands that your dog understands, whether your dog knows what to do when they hear a certain command and whether the command is creating an uncomfortable feeling in your dog. Most likely, you need to simply repeat training for a specific command and make your dog feel more comfortable through rewards and praise. 15. Never use your dog’s name in anger. You should try to reprimand your dog without using his name so that there is no negative association with the name itself. When you praise your dog, call him by name so that the dog responds happily when he is called by name. You may find that simply using the dog’s name will get him to come to you eagerly in just a short period of time. 16. Earn the respect of your dog. If you hit or scream at your dog, he will quickly lose respect for you. And instead of becoming a loving companion, will become reserved and fearful. Therefore, be sure to avoid training when you are in a bad mood and avoid negative reinforcement whenever possible. Staying upbeat will make your dog more willing to do whatever it is that you expect from him and help the two of your form a good relationship. 17. Never use a training technique that is not natural and comfortable for you. If you are using a technique that does not come naturally, your dog will sense your hesitation as quickly as he will sense fear or anxiety. This can lead to your dog ignoring any commands given and cause frustration for both of you. Therefore, work to find techniques that you understand and feel comfortable with before starting to train your dog. 18. Consider an obedience training class. There is no shame in asking for help with training your dog. Some people are simply not equipped to train their dog on their own, either due to a lack of patience, inexperience or not enough knowledge. Investigate different obedience training classes in your area and sit in on a few to determine whether or not they might work for you. 19. Consider a training club. Some kennel associations offer training clubs to their members and the general public. These groups will often allow member access to professional trainers, and the knowledge of other members. Some breeds are more difficult to train than others, and having this type of resource available may be an excellent asset to your own training program. 20. Learn about your dog’s breed. Different dog breeds may respond better to different methods of training. Dogs of different sises may also require different types of training. For example, if you have a small terrier who likes to jump it is less dangerous to all involved than if you have a St. Bernard that weighs in at 150 pounds who likes to jump! You will need to concentrate on different areas with different breeds and sises of dogs, and knowing what to expect is half of the battle. 21. See yourself as the team leader during training. You are not the only one responsible for successful training sessions. If you see yourself and your dog as a team in training, you will be much more successful than if you assume the burden of all responsibility. You need to be aware of everything that goes on during training, because you are the leader. However, realise that your dog must be a willing participant for training to succeed. 22. Remain calm and relaxed. Your dog will sense fear, anger and anxiety. Therefore, in order to be effective you must stay calm. Issue commands in an authoritative voice and be firm and consistent to keep your dog’s attention. Any behaviour on your part that is out of the ordinary will keep him from staying focused and reduce the effectiveness of your training efforts. 23. Be consistent. If you aren’t serious about wanting your dog to perform or stop a specific action, then do not issue the command. Otherwise, you are going to teach your dog that you only mean what you say some of the time. This will lead to confusion on your dog’s part and frustration on yours. It’s much easier to only issue commands that you will enforce. 24. Recognise and respect your dog’s needs. Just like people, you will find that when a dog’s basic needs are not being met he will misbehave more often. Be sure that you are providing quality food, plenty of water, constructive socialisation with people and other pets, adequate shelter and safety and lots of exercise. When these needs are met, teaching your dog the basics will be much easier. 25. Practice, practice, practice. Practice makes perfect, isn’t that what your mom always said? Well, dog training is no exception! If you’re going to work on training your dog, make sure that you practice consistently for several 5-10 minute intervals throughout the day. Focus on practicing one skill at a time until your dog has mastered it and then move on to something new. Be sure to revisit already learned tricks and behaviours regularly though so they are not forgotten. 26. Expose your dog, slowly over time, to different situations. It is critical to emphasise to your dog that you expect him to behave consistently regardless of his surroundings. One of the best ways to do this is to socialise with your dog. Introduce him to new people and other animals (dogs, cats, etc.) so that he learns to be social. Take him into unfamiliar surroundings whenever feasible so that he learns that regardless of where he is you are still there and in charge. This will allow you to have more effective control, and will alleviate anxiety caused by unfamiliar people and surroundings that can lead to misbehaviour in the future. 27. Find out what works. Not every child learns the same way, and not every dog learns the same way. 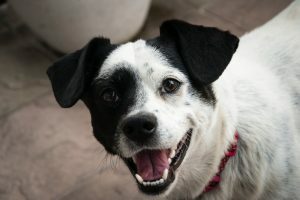 Therefore, you should attempt to use different training techniques until your find one that you are comfortable with, and that works with your particular dog. The general rule to remember is that if a technique isn’t working after a week, you should try something else.